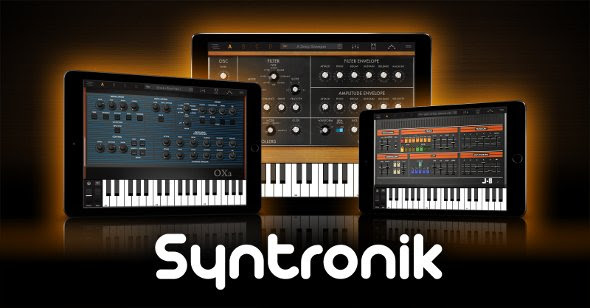 IK Multimedia announces that Syntronik, the legendary synth powerhouse, is now available for iPad from the App Store.Syntronik offers the largest and best-sounding collection of classic synthesizers in a virtual instrument for iPad to date. This is thanks to a unique combination of the most advanced sampling techniques with a new hybrid sample and modelling synthesis engine, an arsenal of high-quality modelled effects and innovative instrument features that raise the bar for flexibility and sound quality. Each of the 37 synths in Syntronik for iPad was meticulously multi-sampled using the most advanced techniques available to capture the "DNA" of the hardware and accurately reproduce the real sound of the classic synthesizers. Adding even greater realism, IK's proprietary DRIFT™ technology varies the phase, colour and pitch of the sampled oscillators in a subtle fashion to keep them moving just like real analog oscillators. The unique hybrid synthesis engine in Syntronik for iPad provides ultimate sonic authenticity thanks to its modelled filter section built by IK, the company that pioneered virtual circuit modelling. Syntronik offers 7 filter types including 4 of the best sounding analog filters of all time: the Moog transistor ladder, Roland's IR3109 chip, the famous Curtis CEM3320 chip and the Oberheim SEM state variable filter. Also included is a Classic low-pass filter and powerful digital filters like Formant and Phase. Plus, all 7 filters can be selected within each Synth, enabling users to mix and match them - like using an Oberheim filter with Moog oscillators - for unique combinations never heard before. Syntronik for iPad lets users forge, mangle and shape sounds in all possible ways thank to 36 professional effects ranging from dynamic processors to amps, filters, EQ's, modulation effects, reverbs and more. 5 effects can be simultaneously inserted on every instrument via an attractive "lunchbox-style" interface that allows for immediate visualization and editing of every parameter from a single screen. The 17 powerful Synths in Syntronik for iPad are easily recognizable by their elegant interfaces with consistent controls for ease of use. Sounds can be loaded into 4-part layered "Multis" with each part containing its own instrument, key splits, arpeggiator and dedicated 5-slot effect section for ultimate sound design flexibility. With 1200 stellar sounding instrument presets, 200 carefully programmed Multis, (available in the full version or with all 17 synths), and 129 compelling arpeggios, Syntronik provides an inspiration factory covering any genre or style of music. Syntronik is now available for free on the App Store and includes 25 instrument sounds from 17 synths. Download it on the App Store.